One of the most frustrating dilemmas for working people today is how to be effective when we feel we don't have time or we're facing non-stop demands. 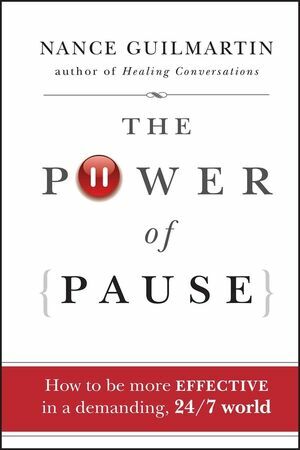 The Power of Pause process is a dynamic practice that Nance Guilmartin has taught thousands of people worldwide, equipping them to regain control of thoughts and avoid miscommunications. This tested method helps readers to take a moment to wonder what's called for when we feel we're short on time, attention, temper, or choices. In that instant, we can use a simple method to rewire our overloaded circuits, tap into our "missing-in-action" common sense, and raise our communication intelligence. This process is not about slowing down the pace of workday life. It is about enabling anyone who is time-pressed to make savvier choices and avoid costly mistakes. The Power of Pause methods enable managers and teams across varying industries/any industry to save time and money, fix problems and achieve goals with less stress–even in the face of competition, cultural and language differences, or tight budgets. Four-time Emmy Award winner Nance Guilmartin is an executive coach, consultant, educator, and author of Healing Conversations. As a Westinghouse Broadcasting executive, she launched the national designated driver program and the For Kids' Sake and Time to Care campaigns, sparking community problem solving in over 100 cities. She was press secretary to the late U.S. Senator Paul Tsongas and a writer-editor for CBS NewsRadio. Guilmartin is a Fellow of Florida International University's Center for Leadership, where she teaches the executive education program Women on the Move, and is a clinical adjunct faculty member at the College of Business Administration. She lives in Massachusetts. An Invitation to the Power of Pause. Part One The Power of Pause Process: How to Shift from Running on Automatic. 1 Restoring the Ability to Choose. 2 What Is a Pause? 3 The Paradox of Pause: You Gain Impact by Taking a (Brief) Time-Out. Part Two Get Curious Not Furious: Take Back Control to Get New Options. 4 What Happens When We're Wired to Snap? 5 Get a Reality Check: Save Time, Money, and Relationships. 7 Have You Been Caught in a Decision-Making Speed Trap? 8 When Curiosity Becomes Your New Default Setting. Part Three What Don't I Know I Don't Know? Ask Better Questions to Drive Success. 9 How Can We Ensure Success in Times of Uncertainty? 10 Drive Success with an Extra Measure of Humility. 11 Revisiting the Resentment Bank Account: Deposits and Withdrawals. Part Four The Art of the Pause: Do What Matters Most and Make It Count. 12 Where Are We Going? 13 What's in It for Me? 14 Appreciations: The Power of Pause in Action. Tips for Effectively Giving and Accepting Appreciation. 15 The Power of Pause Practices: Twelve Ways to Be Your Best and to Succeed in a Demanding, 24/7 World. It's Time: Now It's Up to You.